Miss USA, Alexandria Mills was crowned Miss World 2010 in Sanya, China at the Beauty Crown Cultural Center. She and all of the runners up were absolutely beautiful. I don’t know how much talent they had but they certainly passed muster in the looks department. 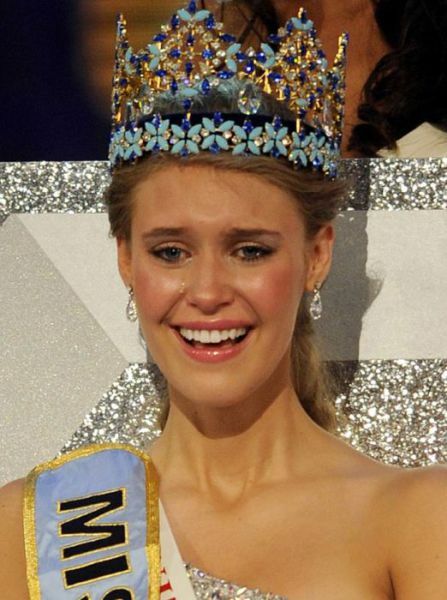 There is literally nothing in the papers or even the blogosphere about the former the ranking Miss Universe (Venezuela), Stefania Fernandez and her silent protest at Miss Universe Pageant (2010) which invisible to nearly everyone — except Venezuelans. In her final catwalk, she suddenly whipped out a Venezuelan flag in a patriotic but protocol-breaking gesture. Fernandez waved her flag — to convey resolution amid distress. Her flag had seven stars, significant because Chavez had arbitrarily added an eighth, making any use of a difficult to find seven-star banner an act of defiance. MISS Venezuela is best , miss usa is ugly fake contest . I think MixedPassion is great. I have enjoyed it for months. I met a lot of successful friends ! Even miss Norway was hotter than miss USA. i have seen better ..
As always, the U.S. has probably purchased or obtained the votes with promises of future contracts or threats, foul dealings. Miss France is Best for me.